Get to know us better and learn how we mold our children to achieve their highest potential. Petits Poussins Too is a bilingual Daycare/pre-school that welcomes students Three months to five years old. Each year, we adapt our teaching according to the group of students, their ages, and needs. We provide bilingual classes that are inspired by the French national curriculum as well as the New York State standards. 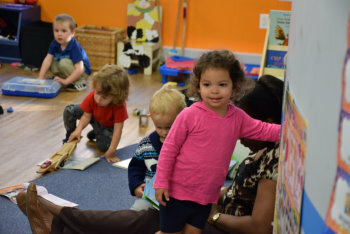 Petits Poussins Too offers 2 programs: An INFANT/TODDLER daycare for ages 3 months to 24 months and a PRESCHOOL program for ages 2 to 5 years old. Infants 3-14 months and Toddlers 14-24 months. At the Preschool level are classes are divided into three groups: Toute petite section (young twos); Petite section/Prek-3 (2.7-3.5 years); and Moyenne section/Prek-4 (3.5-5). At the beginning of the school year, our first two weeks are used to get to know the children and to assess their learning. We have a teacher/student ratio between 3/1 and up to a maximum of 10/1 for the older groups. Our teaching staff is very diverse, has great experience in the classroom, and is very nurturing towards the students. Every year we meet for one week of professional development to revisit the curriculum, improve it, and adapt it to the group of children entering that academic year. At Petits Poussins Too, we provide a rigorous academic bilingual French program inspired by the Education National curriculum in France. Our mission is to provide a warm, nurturing environment for our international students from birth going on to 5 years of age. We welcome children from all cultures and backgrounds and always value their identity and heritage. Our French and English speaking staff motivates and guides our infants and preschoolers in becoming independent, confident, and caring, in a bilingual setting. Our curriculum focuses in depth on bilingualism and the development of a second language while, from the early stages of their lives,developing our children’s fine and gross motor skills. Our vocabulary-rich curriculum, infused with sing-a-longs and read-aloud at all ages, helps our children develop vocabulary in a stress-free environment. While building a second language our children are eager to communicate and apply what they have learned in class into their everyday lives and routine. At Petits Poussins Too, our children, Toddlers, and Preschoolers learn and play in the classroom at different learning centers. They build vocabulary by playing and interacting with each other. We have several centers: kitchen, puzzles, a workbench with tools, cars and trucks, blocks/Lego’s for all ages, library, dolls, and figures. All our activities are done at a level that is appropriate to the child’s developmental stage. At Petits Poussins Too, learning takes place in various ways: reading, singing, and drawing. We value all our children’s “Multiple Intelligences” and help them learn in the best environment suitable for them. Learning is individualized according to each child’s need. services needed for the child when needed. We believe that each child can succeed academically and to the best of his/her abilities when given the right tools. We put all efforts forward so that all our students may reach their full potential in a bilingual setting. At Petits Poussins Too, we teach through Positive Reinforcement. We continuously encourage and applaud our children for all their achievements. Our children are taught to problem solve by themselves in order to become more independent. Finally, our teachers serve as role models by continuously showing appropriate behavior amongst themselves. At Petits Poussins Too, we focus on community building. We teach our children how to share and how to ask for things politely. We learn how to get to know each other by knowing about things each child likes and likes to do. We learn about our differences and learn to value and respect them.